Losing games to power conference opponents Florida State and Oklahoma State opened the eyes of LSU basketball coach Will Wade. Nothing provides more insight for a coach than facing quality opponents. The Tigers dropped an overtime decision to the Seminoles and then suffered a double-digit loss to the Cowboys. Florida State was definitely the better of those two teams. 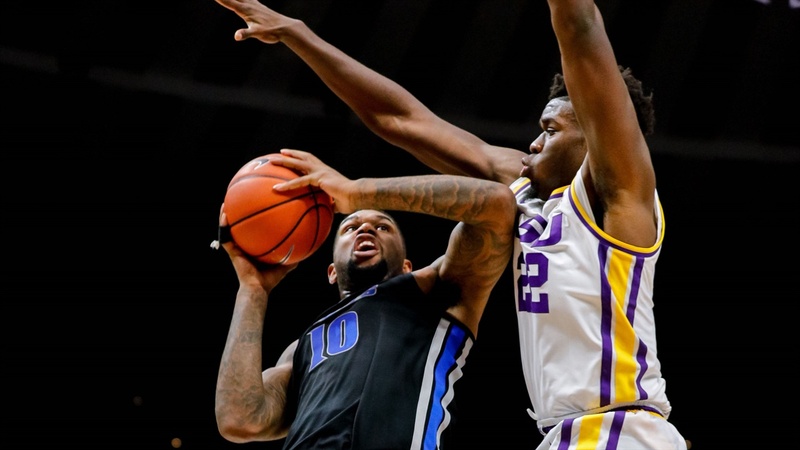 When LSU plays host to Grambling at the PMAC on Saturday (4 p.m. Central/SEC Digital Network), Wade intends to use a different player rotation. In addition, Wade will implement a different offensive plan against Grambling. Wade acknowledged that he will make lineup changes Saturday, but he did not identify them. Wade did admit that Darius Days and Marlon Taylor will get more minutes on the wing. Days has played primarily in the post in LSU’s first seven games. “Days is one of our most efficient players,” Wade said. “He has a lot of similar qualities to Skylar (Mays). He is a good shooter although he has not shot the ball well (from 3-point range) so far. Days is averaging six points and five rebounds while playing 16 minutes per game. He is shooting 50 percent from the field – 27 percent on 3-pointers. Taylor is averaging four points and two rebounds while playing 12 minutes a game. He is shooting 42 percent from the field – 25 percent on 3-pointers. Wade didn’t say which players would lose minutes. It is obvious Wade wants more size on the wings. Ja’vonte Smart and Daryl Edwards may see their playing time decrease. Smart is averaging 11 points and four rebounds in 28 minutes. Edwards is averaging five points and two rebounds in 18 minutes. Even though LSU is averaging 81 points per game, Wade is not satisfied with the offense. The Tigers are making only 33 percent of their 3-point shots and are averaging 13 turnovers per game – three more than Wade’s desired number for this team. LSU will begin running more sets on offense. As Wade explained it, the first few seconds of the shot clock will be when the players control what’s being done. After eight seconds, Wade will take control. Wade will go back to his old philosophy of playing inside-out. Post players must get touches. “We are going back to throwing the ball inside,” Wade said. “We were not playing well the other way. It wasn’t working. Playing inside out will help us in the post and will help our guards. We are going to throw it inside and keep throwing it there until they get tired of taking the little hook shots. LSU’s four post players – Naz Reid, Emmitt Williams, Kavell Bigby-Williams and Days – are making 65 percent of their 2-point shots. Reid has the lowest percentage of the four at 58 percent. The Tigers’ five perimeter players – Tremont Waters, Mays, Smart, Edwards and Taylor – are making 34 percent of their 3-point shots. Only Mays is shooting higher than 31 percent from behind the 3-point line. Waters is off to a somewhat slow start – averaging 11 points and six assists per game. Waters is not shooting well – 39 percent from the field, including 28 percent on 3-pointers. In addition, he is committing four turnovers per game. “I’m just not making shots,” Waters said. “I am still putting in the work. Last year, I was taking 20 shots a game. Now, I am taking seven or eight shots a game. I need to be more efficient. Wade is not worried about Waters’ below-average start to the season. “Tremont is going to be fine,” Wade said. “He has taken things head on. We did a study on all of his turnovers this year. He knows what he has to do to get it corrected.